By Steven R. Fox, PhD, P.Eng. Steel’s versatility and durability make it a suitable building material for various construction projects and applications. For cladding and roofing applications, there are different types of sheet steel assemblies, ranging from the simplest single-sheet walls found in agricultural buildings to sophisticated composite panel assemblies. This wide variety of cladding profiles, paint systems, and colours allows for greater design freedom and durability in a cost-efficient and sustainable solution. With the introduction of updated energy codes and standards, such as the National Energy Code for Buildings (NECB), provincial jurisdictions are enacting more stringent requirements on the thermal transmittance of the building envelope. 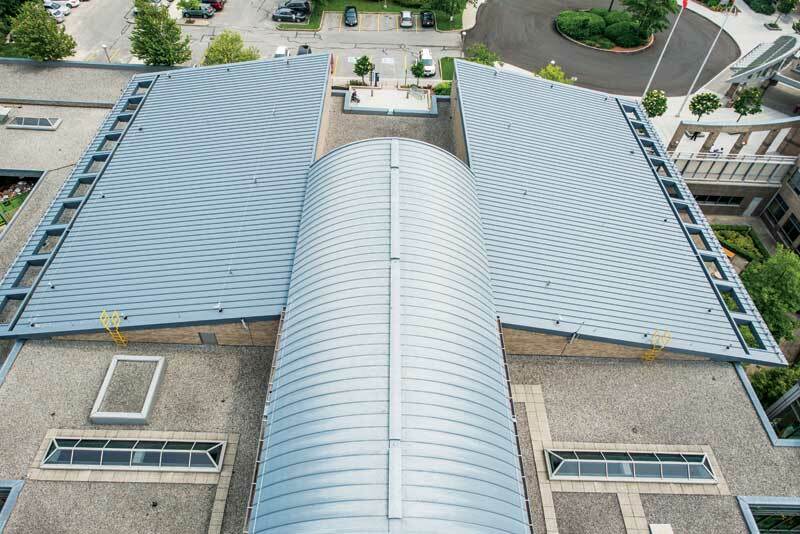 To meet these requirements and comply with current Canadian codes, steel product manufacturers have developed an array of insulated sheet steel solutions for both wall and roof applications. These insulated assemblies comprise insulation sandwiched between the prefinished sheet steel exterior and interior sheets, with the exterior steel sheet being the exterior cladding of the wall or roof assembly. Insulation for construction materials is typically rated with an R-value (which represents a material’s thermal resistance) or U-value (representing the rate of heat transfer). Building codes typically require construction projects to use systems with a maximum U-value, which changes depending on in which of Canada’s six climate zones a project is located. With a vast difference in climate from the northern reaches of the country to its southern border, the materials and products allowed in buildings vary greatly throughout Canada. A full listing of major Canadian cities’ climate zones is available in NECB. 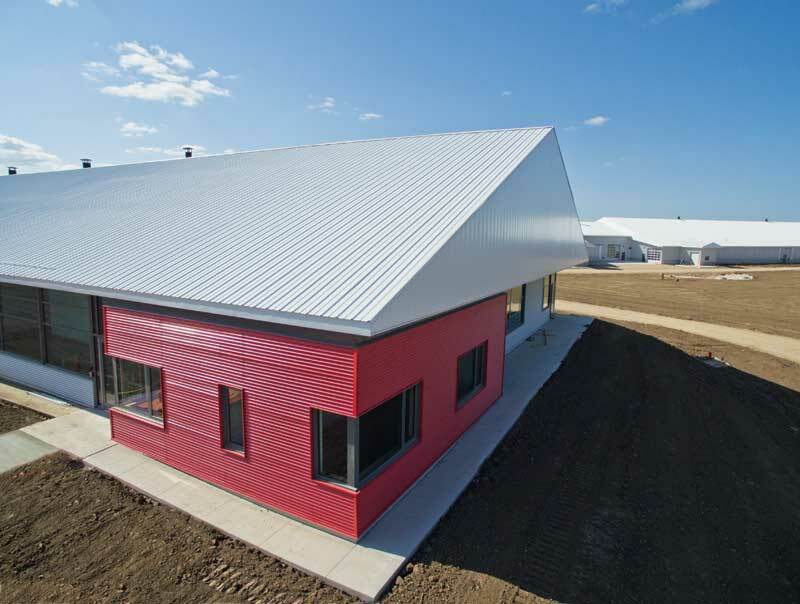 Insulated sheet steel roof and wall assemblies can use a variety of insulation materials to meet requirements for Canadian climate zones, including extruded polystyrene (XPS), expanded polystyrene (EPS), and polyurethane. The R-values of these materials range from approximately R-3 to R-7 per 25 mm (1 in.) of thickness. Panels can be manufactured in a variety of thicknesses to meet requirements across the nation. Insulated sheet steel wall assemblies are designed and constructed to recognize both the structural requirements of the system and the other functions of the assembly, which can include acting as a rainscreen, air retarder, vapour retarder, and insulator. As a vapour retarder, the assemblies control migration of moisture from the warm interior through the wall assembly to the outside. In co-ordination with air retardation properties, vapour retardation helps reduce or eliminate uncontrolled infiltration and exfiltration of air and moisture—the primary causes of heat loss in an insulated assembly. For roofing applications, there are different types of sheet steel assemblies, ranging from the simplest single-sheet walls found in agricultural buildings to sophisticated composite panel assemblies. Insulated sheet steel assemblies can be beneficial for energy costs across a wide variety of wall applications due to their ability to create tight building envelopes and also reduce heat transfer. These properties have been especially effective for applications in cold Canadian climates, where there are many days when the interior temperature is much greater than the exterior. In roofing applications, insulated sheet steel assemblies can be manufactured with various finishes, colours, textures, roofing profiles, and thicknesses. Each of these variables affects a roof’s overall reflectivity and its emissivity, allowing builders to select the appropriate panels based on their climate zones and number of heating degree days in their regions. For buildings in warmer areas, such as Windsor, Ont., where cooling loads are greater, panels can include more reflective coatings to re-emit as much absorbed infrared (IR) radiation as possible. In areas further north, where heating loads are greater, it is important to consider panel and coating options with low emissivity to reduce the amount of solar infrared radiation emitted back into the atmosphere. When appropriate coatings, profiles, and insulation thicknesses are selected for the roof assembly, commercial buildings should consume less energy in maintaining comfortable temperatures for occupants.